I have been growing Micro Tom tomatoes for a short time now, over that time I have grown several generations of them, saved pure seed, and crossed them with various other tomatoes to try and create new micro tomatoes. Micro Tom tomatoes are a delightful little plant, the more I grow them the more I like them. I have read a few different things about Micro Tom on the internet, unfortunately much of it is very different from my observations. I thought I would write a blog post to clear up some confusion about Micro Tom tomatoes. 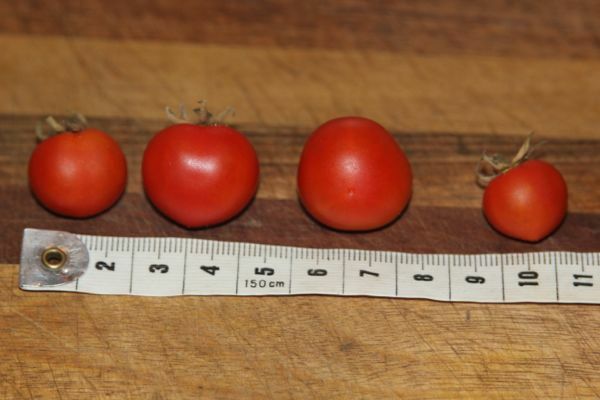 Micro Tom has been declared as the world's smallest tomato variety. It was released from the University of Florida in 1989 where it was developed by Dr. J.W. Scott and Dr. B.K. Harbaugh. I have read various people on the internet claiming that because Micro Tom was bred at a university that it must be a Genetically Modified Organism (GMO), others that say it is not, some that say it is a hybrid, some that say F1, others that say Micro Tom is open pollinated. So I did some research on Micro Tom tomatoes. The truth is that Micro Tom is a stable tomato variety which is as stable as any other tomato variety, it can be grown open pollinated and seeds will grow true to type unless it is crossed with another variety. 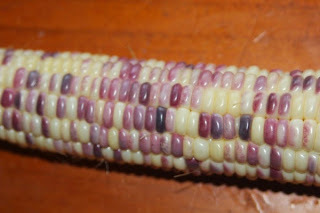 Micro Tom is NOT a GMO and was bred conventionally in the same way as almost everything else that you have ever eaten. The reason Micro Tom grows so small is due to at least three different genes that were bred into it conventionally, the same way that red colour was bred into tomatoes. These three genes were all spontaneous mutations so nothing untoward has gone on here. Micro Tom has a combination of three different genes which make it grow tiny. 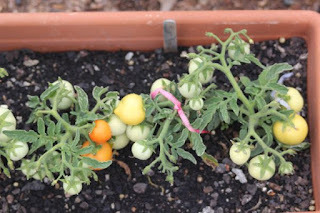 One gene is for dwarf growth that is common in dwarf tomatoes, it is most likely d. Strangely this dwarf gene also has a mutation in Micro Tom, but that is a rather complicated story for another time. Micro Tom has the self pruning gene which is responsible for creating determinate tomato plants, it is most likely sp. Micro Tom also has the sun dwarf gene which creates extremely short internodes under high light intensities, it is most likely sd. I assume that if grown in low light then Micro Tom would be a bit taller, but even when grown in winter my plants are always under 10cm tall. All three of these genes are recessive, which makes breeding new micro tomatoes using Micro Tom as the female parent a reasonably straight forward process. "produces a crop of around 40-plus cherry tomatoes per plant"
"bear 1-3" good flavored tomatoes in heavy quantities"
"The plants are suprisingly productive, a 6" plant can produce up to a couple dozen fruits." "is loaded with tasty fruit"
"bearing loads of flavorful, 1 oz., deep red fruits"
"Plant produces good yields of tiny pea size red tomatoes"
"I am able to harvest about 20 - 30 tomatoes from this plant growing in a 6in pot"
My growing conditions are a lot more harsh than most, so perhaps I get less fruit per plant than I could. I dare say that your growing conditions are also not perfect. Keeping that in mind, I would not consider any of the above reviews of crop size to be accurate. I normally get around 10 tomatoes per tiny Micro Tom plant. Sometimes a few more, sometimes a few less. If I used fertilisers and coddled the plant I think I could get around 20, but I am happy with it producing 10. I certainly would not say that it is 'loaded' with fruit or produces 'heavy quantities' or produces '40 plus' tomatoes. I also found a Japanese research company that sells Micro Tom seeds to scientific organisations for the purpose of genetic research, they said "It yields about 20-30 seeds per fruit. One plant yields about 200-300 seeds" in other words, about 10 fruit per plant, much the same as I am getting. 4-7 inches, 4-6 inches, 5-8 inches, 6-8 inches, under 12 inches, 8 foot (I hope that this one is a typo and they meant inches). My Micro Tom plants are all descendants of one old seed, so the genetic pool with which I work is rather narrow and may not be indicative of overseas strains. Personally I am yet to have a Micro Tom plant reach 10cm (about 4 inches). Mine have all grown between 4cm and 9cm tall. Growing in a cup of soil or in the garden has not changed the height noticeably. "1 oz deep red fruit"
"Pea size" being the most common fruit size that I saw, but probably the furthest from the truth, although I can not even begin to imagine a 3 inch (7.5cm) tomato fruit on a 4 inch (10cm) plant!!! My fruit are reasonably consistent in size, around 2cm, this photo shows how large they are for me. I have given seeds to a few other growers, they all report Micro Tom tomatoes mostly being about 2cm. Days from transplant when grown under lights in winter/early spring, 39, 75-85, 70-90, 88. As you can see, that makes no sense at all when you try to compare the same information on different web sites. The first time I grew Micro Tom I recorded around 113 days from planting the seed until harvesting the fruit. Then I grew it a few times without recording the dates. This last time I recorded 97 days from planting the seed until harvesting the first ripe fruit. They are ok, Micro Tom lack any real depth of taste and will not be anyone's favourite tasting tomato variety. They taste much nicer when ripened in warmer weather than they do in cooler weather, and at some times of the year they taste a bit nicer than cherry tomatoes that I can get from the shops. While Micro Tom is certainly not the best tomato you will eat they are far from the worst. I have never seen someone who ate one and disliked it. I really like Micro Tom tomatoes, the plants are tiny and the fruit tastes ok. I don't see the point in exaggerating when describing plants. If people want to grow them, then they will grow them even if they do not produce millions of fruit on a tiny plant. 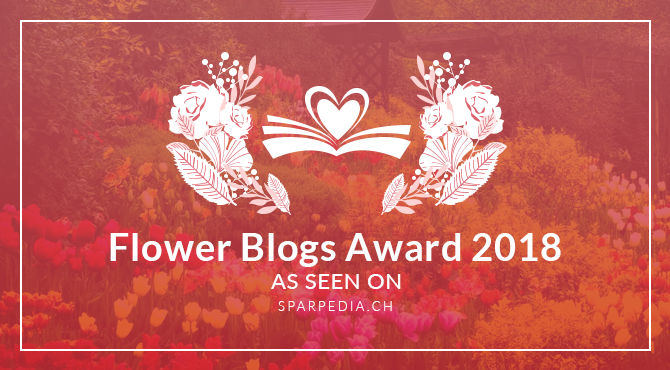 I have shared seeds with several seed savers and a few dedicated growers. I also list organic seeds for sale on my for sale page when I have enough to spare. At this stage this is the only place in Australia to get Micro Tom tomato seeds.